When someone mentions pirates, it often leads to the romantic image of a bearded man with a gold ring in his ear and parrot on the shoulder. Films such as Pirates of the Caribbean have helped to enhance the image of pirates as loveable rogues. But in the 17th century, the threat of pirates was a real one, and Barbary pirates in particular were at the height of their plundering power. In the Chapter Library is a volume by Pierre Dan, entitled Histoire de Barbarie, et de ses corsaires…. [SGC RBK D.15] Published in 1637, it tells the story of the Barbary Corsairs whose particular preying ground was the coasts of Italy and Spain. Operating out of ports in North Africa, they were responsible for the kidnap and enslavement of between 1 million and 1.25 million Europeans over the course of 300 years. The sale and then later ransom of these captives was a lucrative business, and one the pirates did not intend to stop. As the number of Christian captives increased, there were calls for Europe to respond. Several Catholic religious orders were founded with the purpose of raising money to buy back Christian slaves. The rescue of Christians from the hands of infidels was seen as a Christian duty, and many devoted their lives to this service. For many of the poorer captives whose family could not raise the ransom, these orders represented their only chance to gain their freedom. Pierre Dan was a French priest of the Order of the Holy Trinity and Redemption of Captives. In 1634, he visited North Africa, where he saw the misery of the slave auctions for himself. He estimated that 25,000 Christian slaves were held in Algiers alone. 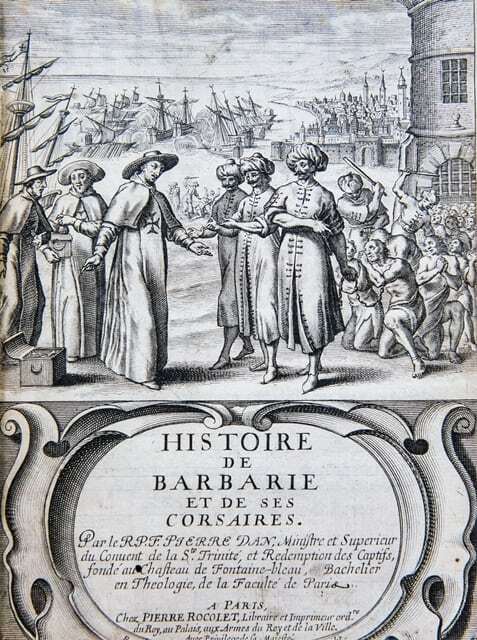 Dan is featured in the frontispiece to his book on the subject, wearing the cross of the Redemptionist order, in conversation with a turbaned pirate and pointing to the ransom coins while ragged captives are brought out in chains. Between 1575 and 1869, there were 82 redemption missions where friars bought the freedom of an estimated 15,500 captives. This volume gives an insight into these troubled times and the true story of the pirates and those unfortunate enough to meet them.